As a tech company, most of the things we work on are sometimes novel in that very few people have tried it in the same circumstance as we currently are. So a lot of the decisions we make sometimes seem really skeptical. But it is important to know that not all good results are always well planned at the beginning. We simply just have an idea and keep working on it and see where it leads. Successful companies sometimes do not know precisely whether they would be successful at a certain time. All they knew was that they needed to take a step and they did. It matters that even when no one sees it for you that you see it for yourself. Whatever your current circumstance are, you need to keep pushing forward and taking bold steps. As a tech team, members must be advised to always take bold and audacious steps as playing by the book would always keep one in a certain frame of mind, but working on a lot of ideas makes it more fun and interesting. To make your team more successful, you need to impregnate every team member with a spirit of boldness. That matters a lot. Well, all products of tech companies are meant to finally get to the hands of clients or users where such products are meant to solve one problem or the other for the client. So the most important thing is that the client’s problem is solved. But while trying to solve a user’s problem, it needs to be done in a very intuitive manner such that the user’s experience with your product lasts long in the mind of the user and they would always long to use your product. 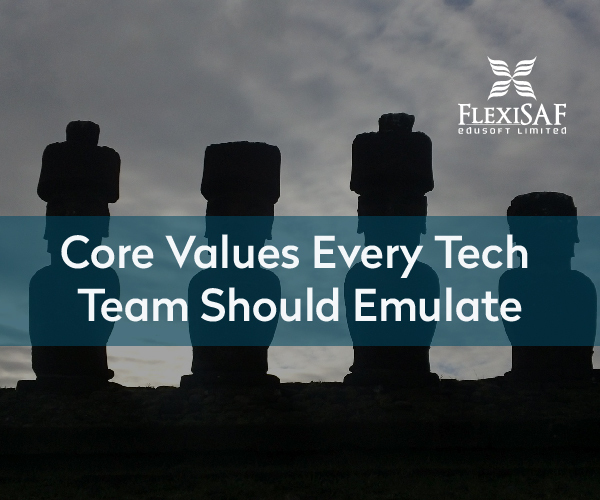 This core value is rather important because a lot of tech companies these days focus heavily on the technology stack or framework to use. But very few frameworks are even available to even understand if users would prefer a certain feature over another. This does not mean that focus on technological stack is irrelevant. It means that more time should also be dedicated to users. This creates a more sense of belonging for the user and it is easier to get more user-based comments about the product. Speed is of essence as what was the hit yesterday is old and already archived today. It is important that tech companies build products as fast as possible. The concept of lean startup should be inculcated. Features should be shipped as fast as possible to the clients. However, in trying to build features really fast, it is important to always be careful about the quality of the code. It is rather better to ship clean and fast code than just a sample of code that its reliability is questioned. These few values are some of the values I believe every tech company and in fact, other businesses need to start applying. Was this helpful? I’d love if you shared this post using any of the social media buttons below.